Natural Fruit Bars Make Getting Healthy Sweet! 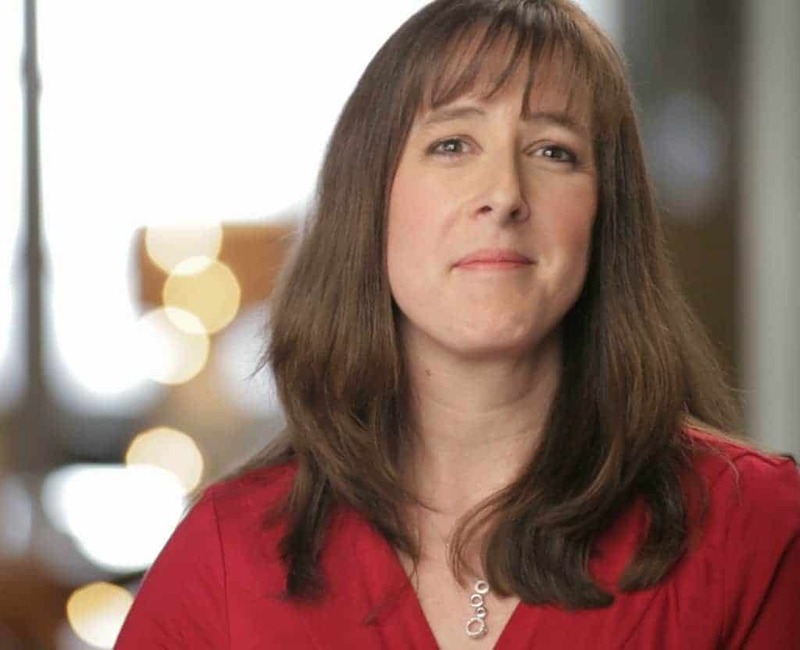 I am a member of the Collective Bias® Social Fabric® Community. This natural fruit bars shop has been compensated as part of a social shopper insights study for Collective Bias and their client. I have mentioned many times over the years that I have a weakness for dessert. Dinner usually includes a little something sweet at the end and when I find myself cruising the pantry for something to snack on, my eyes are always drawn to sweets rather than the more healthy options in there. Getting healthy can be difficult if you have a sweet tooth! My family is always happy to help me indulge my sweet tooth when I succumb so on Mother’s Day I treated myself to a trip to the ice cream shop. And yes, I ate the whole thing! On special occasions like Mother’s Day I don’t worry so much about making healthy snacking choices but what about the other 364 days out of the year? 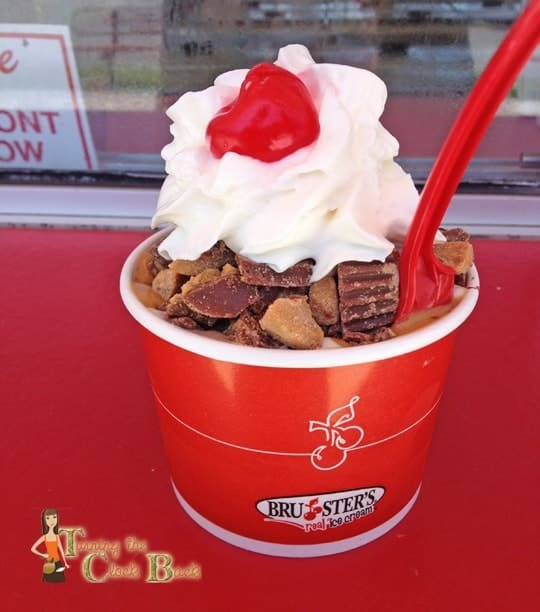 If I gave into my sweet tooth with an ice cream sundae every day I would never fit into my pants! In fact, after a year of those things I would not fit into my HOUSE! So, for the other 364 days a year I try to make sure that the treats I indulge in fit with my goals of getting healthy. 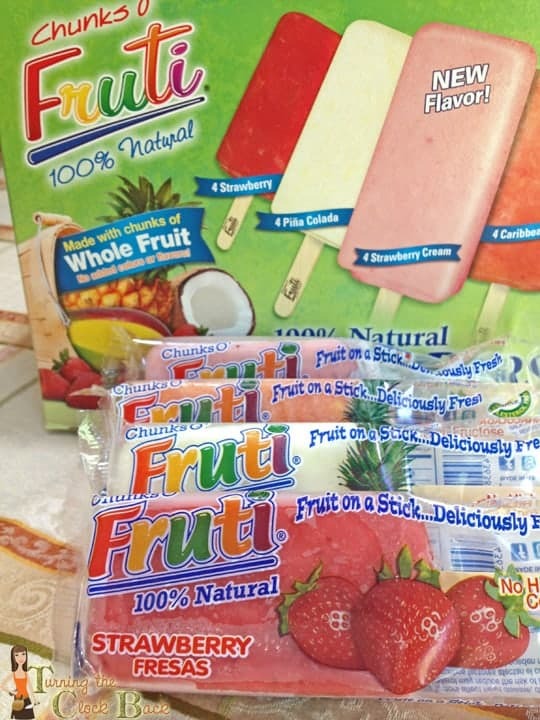 When I was asked to try out a delicious and healthy natural fruit bars from Fruti I was thrilled….a smart way to indulge my sweet tooth without the guilt and weight gain of an ice cream sundae! I have been wanting to get a membership to Sams Club for quite some time now to help reduce the cost associated with getting healthy and eating right. Healthy foods are not always cheap but buying in bulk at Sam’s Club will help me stay in budget while still eating healthy foods. I found a nice selection of nuts, dried fruit, organic granola and even organic veggies at Sam’s Club. I also found the Chunks O’ Fruti natural fruit bars variety pack. This is a 16 count package containing four different flavors of the tastiest, all natural l fruit bars I have ever had! Fruti natural fruit bars are made by the Natural Fruit Corporation and come in flavors like Pina Colada, Strawberry, Caribbean Mix, Strawberry Pina Colada and Pineapple Mango. They select only premium fresh fruit from around the world for these natural fruit bars. Fruti’s fruit bars contain more fruit than any other ingredient. Because there is so much fruit, there is no need for added colors or flavors. 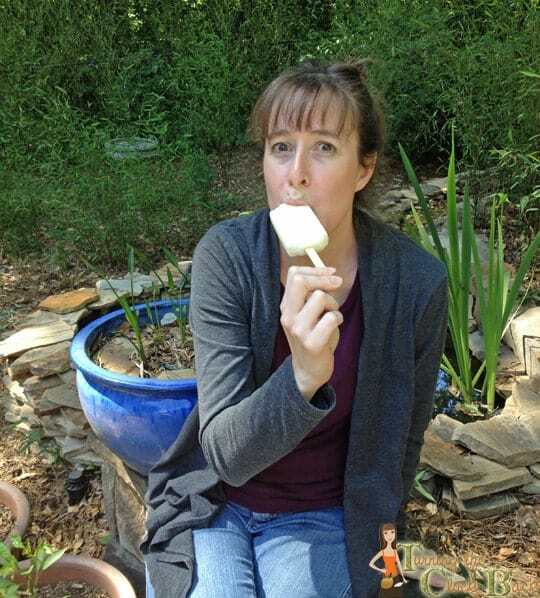 I love knowing that there are no artificial flavors or colors in these natural popsicles! There is also no high fructose corn syrup in them which is very important to me. There is so much fruit in these frozen treats that they require minimal added sweetener at all. The small amount that is added comes in the form of natural cane sugar. They are also non GMO project certified, vegan, Kosher, gluten free and made in a peanut free facility. A great healthy snack choice if you have dietary restrictions you need to follow. 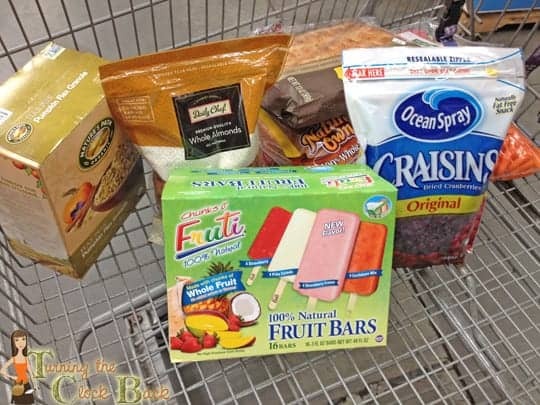 Buying a 16 count package of these natural fruit bars at Sams was a smart choice because once I got them home my children descended on me like ants to a picnic and quickly grabbed their own personal favorites. Because this is a relatively large box and freezer space is always tricky to find, Fruti natural fruit bars actually come in four smaller boxes tucked inside the larger package. Each flavor comes in it’s own smaller box which can be removed and tucked into a smaller spot in your freezer. I like that I don’t have to worry about how to fit a huge box in my freezer. When I was at Sam’s Club shopping, I got the change to try out a delicious creation that was being made at one of the demo stations in the frozen food isle. 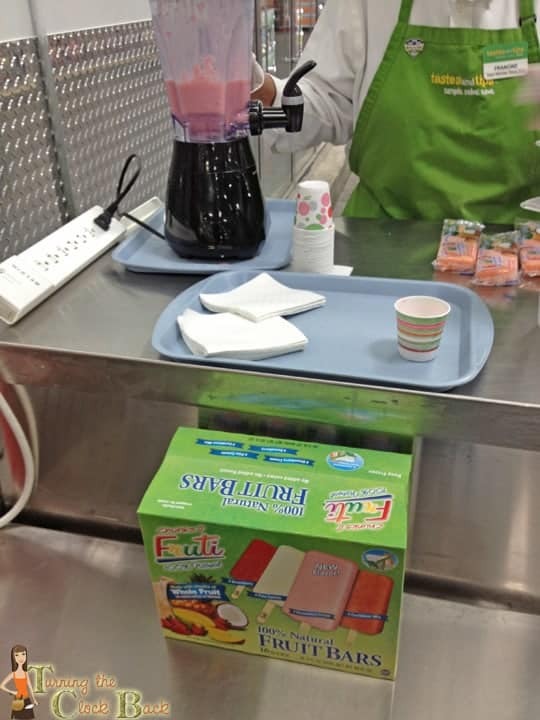 The woman behind the cart was making a Fruti smoothie with a small amount of plain yogurt and just a touch of water. It was seriously so delicious I went back for seconds! Yes, I know, my sweet tooth strikes again but this was a healthy treat so I didn’t feel quite so guilty. If you want to try the smoothie for yourself or want to see some other creative ways to use these natural fruit bars just check out the Fruti recipe page. I tried a frozen smoothie with the Strawberry Cream and the Pina Colada and both were creamy and sweet and would make a great summer treat for either me or the kids! I really loved the flavor of these natural fruit bars and even more, I love the ingredients and the commitment to whole foods that the company has. My kids are happy to eat neon blue artificially flavored things but that is not the kind of food I like to keep in the house. 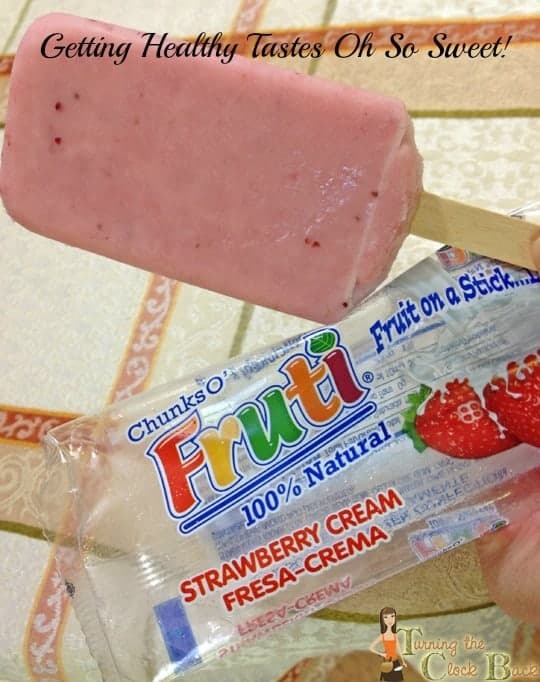 Fruti natural fruit bars were a delicious frozen treat that all of us, young AND old (or oldER!) can enjoy! The flavor was nice and sweet and the bars are full of chunks of real fruit that gave it a great texture. These bars are a much smarter choice for healthy snacking than many other frozen treats on the market. And they are a MUCH better choice for daily snacking than the gigantic ice cream sundae I splurged on for Mother’s Day. Something like that might be nice to do occasionally but for day to day treats, Fruti is a smarter choice that will ensure I can still fit into my pants for many years to come! Getting Healthy With Natural Fruit Bars! If you would like to learn more about Fruti natural fruit bars you can check them out on Facebook and Twitter. Make sure you check out their recipe page. You can also follow them on Pinterest for more information and some great recipe ideas. If you want to see more of my shopping experience, check out my Google + album. Disclaimer: I am a member of the Collective Bias® Social Fabric® Community. This shop has been compensated as part of a social shopper insights study for Collective Bias and their client. Those look amazing! I wish we had a Sam's Club!